Top of the range model from the world leaders in robotic mowing. Smart enough to negotiate the challenges of large and complex lawns – like multiple narrow passages, obstacles, tough terrain, areas of up to 5,000m2 and slopes up to 45% or 24o. 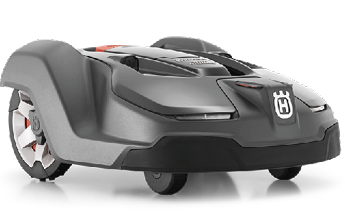 GPS-assisted navigation and a host of features including Automower® Connect make it the intelligent way to keep your lawn green, healthy and perfectly mowed. The Automower® Connect app keeps you in control: track, interact and stay updated at the touch of a screen, wherever you are in the world. Robotic lawn mowing is all about reliability. Husqvarna has, during 20 years of development, refined its robotic concept to achieve the highest level of reliability, quality and cutting result, with a minimum of assistance. Thanks to its unique cutting system, Automower® works discreetly and quietly, when you want.